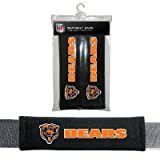 Show your team colors and stay comfortable with these seat belt pad / shoulder protectors. These universal fit pads are great for seat nad shoulder belts and are made with 100% soft polyester material. Team logos are printed on each pad. Great for seatbelts, gym bags and all other shoulder straps.